Campaign Finance: Because they don’t want us to all live in a Libertarian paradise? Why would such interests campaign for us to invest in public infrastructure? Just asking. Alas, it looks like we’re doomed to subsist in a socialist hellhole where people pool their resources for the greater good toward construction of public projects which also allow large corporations to make money. We could just walk cross country and pay ferry tolls to intrepid pure capitalist entrepreneurs at private river crossings. Will we ever come to realize the gross inefficiencies of the state? Just asking. According to Ryan Cooper at WaPo’s Plum Line, one of the two key senators behind a new attempt to do something about our badly decaying national infrastructure is none other than our own Roy Blunt. Guess he’s getting a little tired of trotting out the same ol’, same ol’ Obamacare scare stories that GOP congress people are obligated to regurgitate at regular intervals, or figuring out how to give his big donors, such as Monsanto, for instance, another lucrative sign of his appreciation, so he’s finally decided to sign on to something important – and, make no mistake, for Congress to begin making bipartisan noises about addressing our dire infrastructure challenges in any fashion at all is a major biggie during this period of cockamaime, mostly GOP-imposed austerity. As Cooper notes “We’ve got ancient water mains, leaky gas pipes, crumbling roads and bridges,” and if we continue to do nothing, they’ll only get worse, fast. No matter how anyone spins it, though, Senator Blunt, deserves some credit. He, together with Democratic Senator Michael Bennet of Colorado, is actually taking the lead in the Senate to introduce legislation complementary to that put forward in the House last year by Maryland’s Democratic Rep. John Delaney. Delaney’s plan would create a $50 billion federal fund to bankroll loans and leverage private investment for transportation and other infrastructure. The money would come from bonds bought by companies who want a tax break if they bring cash earned abroad back to the United States. Of course these corporations will pocket their tax break, and busily continue piling up their overseas Smaug-like hoards so they can start whining for another one (that’s what they did last time), but as a stopgap measure until we get a less-insane Congress, this is not totally horrible. I fear that right now, that’s as good as we’re going to get. What’s wrong with Missouri? Could it be her politicians? In the past I’ve noted that Missouri hasn’t been doing so well when it comes to specific measures of qualilty of life. It has also seemed apparent to me that the state’s often low rankings in crucial areas have lots to do with the quality of government its citizens have selected – and here I’m talking – mostly – about the legacy of Republican Governor Matt Blunt as well as the antics of the GOP circus that has disabled Jefferson City over the past few years. — The American Society of Civil Engineers (ASCE) 2013 Report Card on American Infrastructure gave Missouri a grade of C-. — Education Week ranked Missouri 41st in education. — America’s Health Rankings put Misouri in 42nd place in their 2012 report. Its 2013 report on senior health outcomes put Missouri 33rd among the states. — The U.S. Department of Agriculture ranks Missouri the 7th worst state in the nation when it comes to food insecurity. Not very flattering to say the least. And now there are two more very sad rankings that can be added to the list above. First, the Center for American Progress (CAP) recently put out a report on the state of women in America. The report measures issues surrounding economic security, health and leadership. Missouri ranked 31 overall in comparative terms and received a grade of D+; the particulars were economic factors: rank 39/grade D-; health factors: rank 35/grade D; leadership factors: rank 24/grade C.
… the conditions present in different communities and [it] is designed to connect economic, academic, civic and other factors together to help identify concrete solutions to lagging conditions for opportunity and economic mobility. From preschool enrollment to income inequality, from volunteerism to access to healthy food, expanding opportunity depends on the intersection of multiple factors. Developed by Measure of America and Opportunity Nation, the Index gives policymakers and community leaders a powerful tool to advance opportunity-related issues and work, advocate for positive change and track progress over time. The Index measures 16 indicators, and scores all 50 states plus Washington DC on a scale of 0-100 each year. In addition, more than 3,000 counties are graded A-F, giving policymakers and leaders a useful tool to identify areas for improvement and to gauge progress over time. And guess what? Once again Missouri, ranked 28th, falls into the bottom half of the fifty states. You can look at the details here. The message from all these rankings is pretty clear. Missouri might not be one of the most attractive states in which to live. Who, given a choice, would want to relocate to Missouri? Or, given a choice, remain in the state? But there is a further message; folks get the government and the concommitant policies that they deserve. Think of the last legislative session in Jefferson City. Bills were put forward to please the gun nuts (and I do mean nuts), conspiracy theorists, nullificationists, anti-abortion fanatics, corporate lobbyists and other influence peddlers. 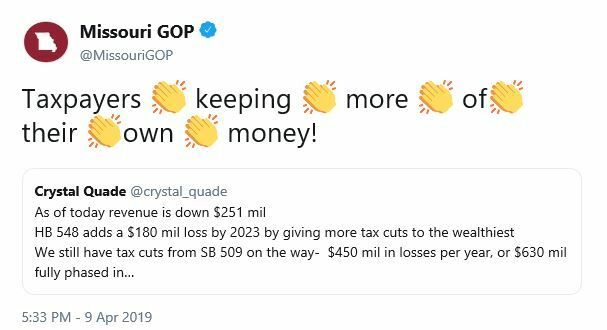 Nothing was done to address any of the issues addressed by the various reports discussed above – actually, by refusing to expand Medicaid, the legislature moved Missouri backwards. Yet it’s very likely that many of the same legislators who were braying loudest about utter nonsense will be returned after the next election. Draw your own conclusions. Addendum: Upon reflection it strikes me that there’s a third message to be derived from this data. Remember when red-meat eating Texas Governor Rick Perry was touring the state trying to persuade all and sundry that he had the key to prosperity? Well Texas ranks at about the same or lower in all the measures discussed above – infrastructure: C+; education: 39th; food insecurity: 2nd worst in the U.S.; state of women: ranking 45/grade F; opportunity index: 38th. 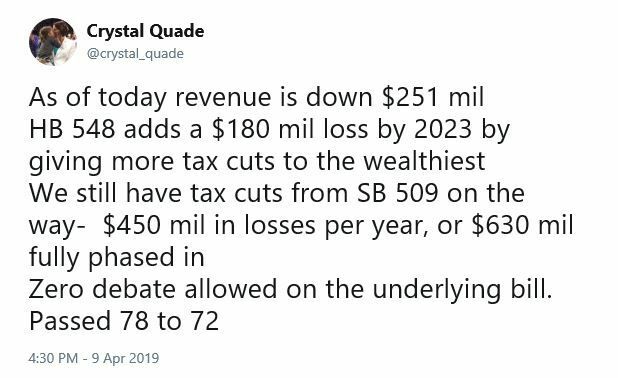 Goes to show that all that Texas has going for it is oil reserves and the related jobs, and, consequently, when it comes to government, the red state solution might not be what’s called for if Missouri wants to fix its problems. All over America, the news is spreading that long-term investment in our national infrastructure, is — amazingly — a good idea. I guess people start to wake up when bridges start to fail, schools fall apart, etc; the writing’s on the crumbling wall, so-to-speak. Rebuilding America is a trillion dollar plus project. Levees, roads, bridges. But while we’re in the infrastructure inventory mood, why not look at some upgrades? God knows, whenever my computer takes a dive and I’m forced to replace it, I always look to moving my specs up a notch or two, don’t you? * replacing our automotive fleets and buildings with cleaner and greener options that make a real contribution toward our nation’s sustainability portfolio. But another infrastructure upgrade, possibly the most obvious, is simply making our homes and offices more energy efficient. And this is a project that will stimulate the economy and create 2,000,000 jobs over 10-15 years. Like health care reform, infrastructure repair, energy efficiency upgrades are a trillion dollar project. Yesterday, in Missouri, 150 concerned citizens lobbied state legislators with the common sense idea behind improving our homes to higher levels of efficiency. Politically practical approaches were laid out featuring game-changing economic initiatives to make all this improvement work and job-creation possible. 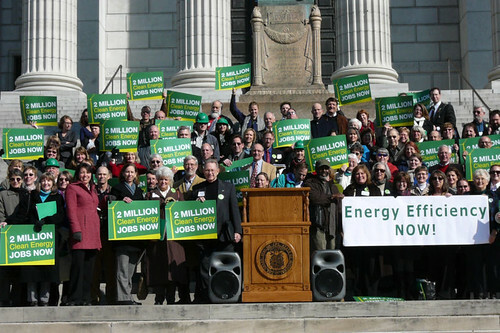 Missourians Tell Legislators: Energy Efficiency Now! Jefferson City, MO – Citizens from across Missouri convened at the State Capitol on Wednesday to urge legislators to update the state’s outdated energy efficiency policies. Participants carried signs calling for Energy Efficiency Now! while listening to state energy efficiency policy experts and Missouri home energy auditors speak of the benefits of efficiency and of legislative solutions for efficiency improvement. PJ Wilson of Renew Missouri explained that Missouri currently ranks 41st in the country for energy efficiency, which costs Missourians millions of dollars on their electric bills each year. Missouri also has one of the nation’s fastest rising energy rates, only made worse in the struggling economy. “Energy efficiency addresses high electric bills and creates in-state jobs,” says Wilson. PACE (Property Assessed Clean Energy) is one of four proposed solutions. PACE is proving to be successful in 14 states and is often consider a “game-changer” for energy efficiency and renewable energy. PACE is state-enabling legislation that allows cities to pursue bonds to pay for a revolving loan program that lends money to both commercial and residential property owners for energy efficiency and renewable energy improvements. It alleviates the upfront cost of efficiency and renewable upgrades by allowing home or business owners to pay for over time through an additional charge on property tax. PACE’s revenue neutral characteristics make it an easy win for legislators and municipalities; it is already receiving bipartisan support in Jefferson City. “PACE provides a longer-term financing scheme for energy efficiency upgrades, so home-owners will make improvements with very low up-front costs. By spreading out the payments over the course of 15-20 years, the energy savings gained each month on electric bills often make the upgrades net positive from day one,” says Marc Bluestone, of Missouri Association of Accredited Energy Professionals (MAAEP). Beyond lower electric bills, pursuing energy efficiency also increases a home’s overall value. “Homes with efficiency sell faster, spend fewer days on the market, and sell for a higher percentage of the listing price. People are starting to figure out that efficiency pays while you live in a home — and when it’s time to sell a home,” said Bluestone. After, the citizens met with legislators throughout the day encouraging action on efficiency. The Energy Efficiency Now! rally on the Capitol steps was a part of Conservation Lobby Day, an annual event sponsored by the Missouri Coalition for the Environment, Missouri Votes Conservation, and the Missouri Sierra Club. Renew Missouri recommends a suite of four “best practice” priorities, and more information can be found at http://www.RenewMo.org. 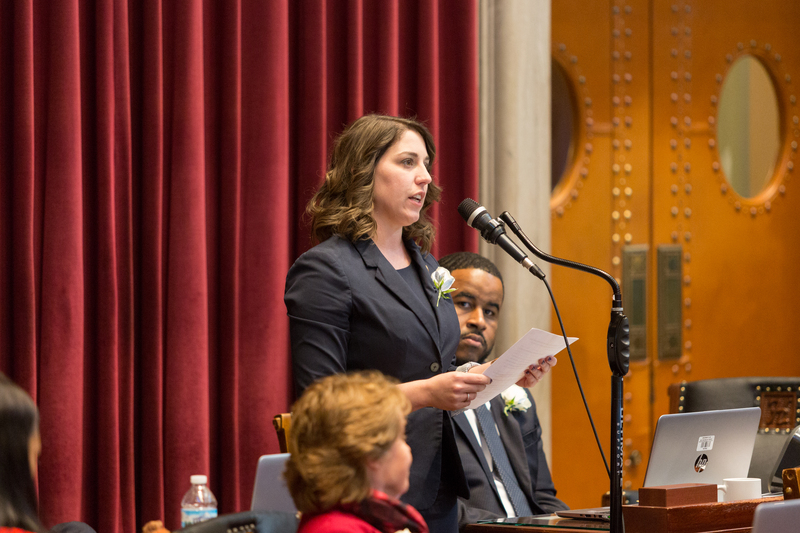 Renew Missouri is a project of the Missouri Coalition for the Environment, has successfully transformed renewable energy policy in Missouri with its work on the Easy Connection Act in 2007 and on Proposition C, a renewable electricity standard, in 2008. The news of energy efficiency is spreading, and as I’ve said before, I predict that not only will every building in our country be audited and analyzed to diagnose what improvements can be made, but eventually, the idea of an energy efficiency audit and retrofit will be as commonplace as the safety and emissions test for your car — you heard it here first!